Biobest is launching newly formulated PreFeRal, a very efficient biological insecticide used to combat greenhouse whitefly. The new product is far more soluble, so that application by spray dispenser, as well as general effectiveness, are both greatly improved. “Efficient control of whitefly starts with effective scouting, right at the start of every new crop. Early intervention with PreFeRal and the application of beneficials is often completely successful, without any need for chemicals. PreFeRal greatly improves success rates,” according to Crop Protection Specialist Arjo van Lenteren of Arend-Sosef. 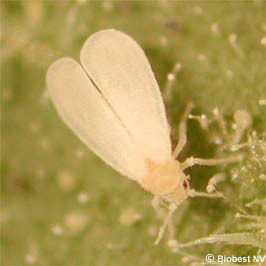 Whitefly is quickly developing resistance against treatment. In addition, beneficial organisms such as Encarsia, Eretmocerus and Macrolophus are often hard pressed to control the rapid population explosions. The proper preventive and follow-up actions, coupled with use of PreFeRal, minimise the need for chemical corrections in crops such as tomato, cucumber or gerbera. In many cases, any chemical intervention is unnecessary. PreFeRal contains the spores of Paecilomyces fumosoroseus, an indigenous fungus. Paecilomyces infects and kills every developmental stage of the whitefly with which it comes into contact. It is absolutely harmless to beneficials, which can continue performing their valuable work. Under ideal circumstances, the fungus will continue spreading its spores through the host body, and so infect other whiteflies. PreFeRal is completely safe for humans. As a result, no waiting periods are required, and the preparation can be used directly prior to and during the harvesting period. This creates an additional safeguard for high-quality produce. Application of PreFeRal will not have any adverse effect on workers present in the greenhouse. Fungus spores must come into direct contact with the whitefly - larvae, cocoons and displaced adults are found on the underside of leaves. PreFeRal is dissolved in warm water and poured into a spray tank. A relatively high percentage of water (2000 – 3000 l/ha) is sprayed using sufficiently high pressure. PreFeRal is most effective at a temperature range of 20°C and 28°C, with relative humidity exceeding 80% for at least 12 hours per day. This means best results are achieved when PreFeRal is applied in the late afternoon or early morning. Biobest is launching a new and improved formula with markedly improved solubility and smaller particles. This new formula will allow you to dissolve PreFeRal quickly and easily, pour it into a spray tank, and get to work without delay. New PreFeRal will save you time and effort. Arjo van Lenteren has more than 30 years of experience working with Arend-Sosef in The Netherlands. He’s considered as one of the pioneers and an important specialist of Biological Control in one of the biggest and important fresh produce markets of Europe. The company Arend-Sosef is a supplier on the horticultural Dutch market, offering a complete portfolio of products and services.